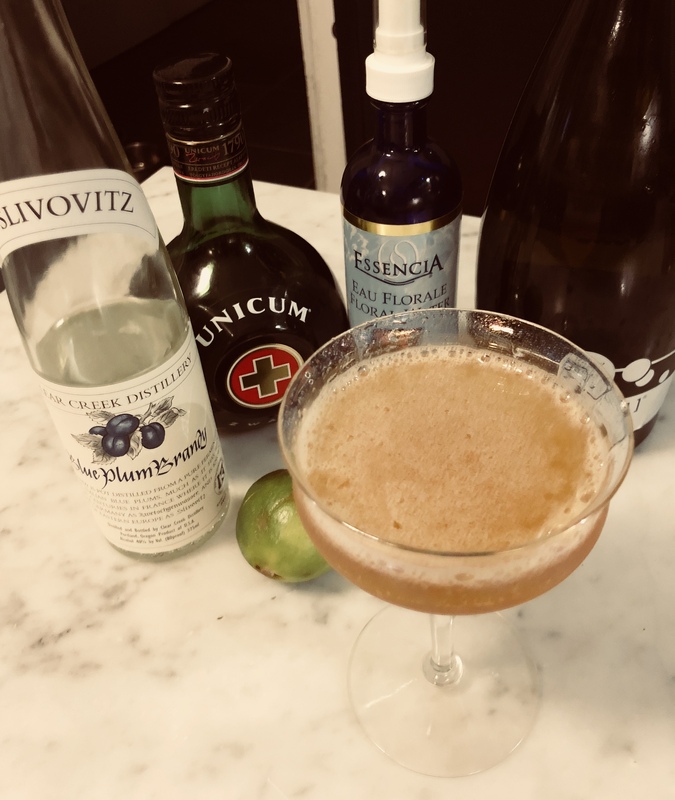 It’s been a while since I posted a drink from the venerable PDT cocktail book. I’ve probably made upwards of 75% of its recipes and it was what truly drew me into the world of cocktails. I also love fruit brandies and had a bit of a craving on the weekend for a plum brandy cocktail. I remember my parents having a bottle of slivovitz growing up. I was, sadly, a well-behaved kid and therefore never sampled any of their liquor. The smell of the slivovitz, however, I remember as being like jet fuel. It’s odd that now I find both the aroma and taste of fruit brandies so out of this world. I guess it’s called growing up. The St. Rita is a nice way to ease into using fruit brandies in mixed drinks. One could easily swap Fernet for the equally bitter Unicum. Overall, the drink is a bit on the summery side, and represents a sophisticated but not overpowering mix of the complexity of plum brandy and the herbal astringency of Unicum. Try to mix up a bit of the honey syrup instead of plainer simple syrup as it contributes much more flavour to the final product. Lastly, any kind of lavender on top would suffice in lieu of the spray. This would include fresh or dried flowers or even a few drops of lavender bitters. Enjoy! Shake everything but wine with ice and strain into a chilled coupe. Garnish with lavender essence spritz and edible flower.